From the first day at the police academy, law enforcement training is long and arduous, especially for recruits who attend live-in or quasi military-style training programs. As hard as it is for the academy recruits, those days spent at the academy can be just as hard for the wives, husbands, sons, daughters, mothers, and fathers back at home. There's a temptation after graduation to think that it's all downhill from there. In reality, nothing is further from the truth. 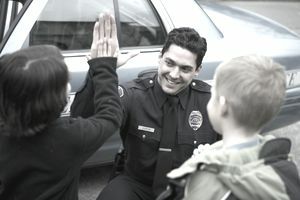 If you or someone you are close to is getting started on a path towards a law enforcement career, you need to know what families and friends should expect when their loved ones become police officers. Perhaps the biggest adjustment for new officers and their families comes from the way academy life, and police training can change a new officer. Police officers tend to view their surroundings much differently than most other people. Brand new officers, fresh from learning about the various threats out there that they may have never given thought to before, are especially wary of the people around them. Due to the emphasis placed on the fact that police should be held to a higher standard, your new officer will likely be quite the stickler for following the law, even if she was something of a rule-breaker before she left for the academy. She’ll also be more than happy to regale you with a litany of illegal behaviors she sees you commit, especially when you’re driving. Few if any new officers are fortunate enough to graduate from the academy directly into a day-shift, weekends-off kind of job. Instead, he’ll probably be placed on rotating shifts with changing days off. If his department works permanent shifts, the rookie officer will probably be assigned to the least desirable shift, which means you can expect him to be working most nights and weekends. This can make planning even the most mundane family events difficult, and it’s a huge adjustment for new officers’ families. During the field training process, new officers need to get exposure to different field training officers and as much real-world experience as possible before being released to solo patrol. This means that, during that time, the work hours will be especially difficult and even sporadic as the new officer will probably change shifts frequently. Don’t tell anybody, but despite the dangers and stresses that come with the career, law enforcement jobs are fun and exciting. Your newly-appointed officer is just finding this out, and will probably not want to talk about much else. The new officer is exposed to a lot of bad things quickly, and all of a sudden has a new awareness of a darker side of the world that few realize exists. Though it is not the case for everyone, new police officers can very easily become cynical and find themselves fighting symptoms of increased anxiety or depression as they try to cope with the tragedies they’ve seen and the criminals they’ve faced. Recognize that dealing with these issues is more common than you might think, and that help is available for those new officers in need. Most people who choose law enforcement as a profession are prepared to make the sacrifices that come with the job. What many fail to realize is that their families and friends will be asked to make sacrifices, too. New officers need all the support they can get, and families and friends should be prepared to give them that support. New officers, too, should recognize that their friends and families are coping, also. By learning ahead of time about the adjustments everyone will have to make, you can help set your loved one up for success as she pursues an exciting and rewarding career as a police officer. What Are Common Myths About Law Enforcement and Police Work?